This is an elegant, minimalist design using only type and letterforms. Note the extreme contrast of type. The giant lowercase orange b extends beyond the edge of the poster, and the line of tiny white type runs edge-to-edge across the middle. The colour contrast is provided by blue/orange (Complementary Colours), and black/white. The design is by Doppelpunkt (double point), a German design studio. 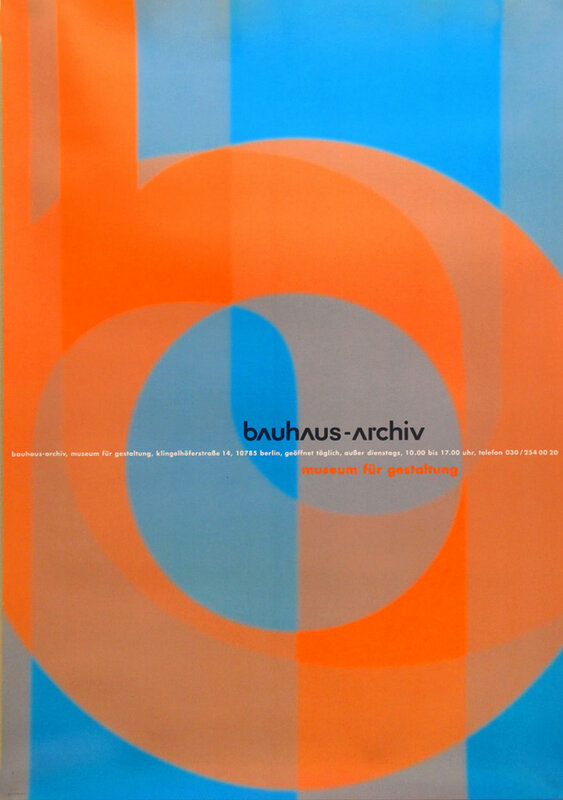 The poster publicized Berlin’s Bauhaus-Archiv. A simple eye-catching design, using a student photograph and large Futura type. Futura was designed in the mid-1920s by Paul Renner and has all the properties of Bauhaus functionalism: it’s geometric, modular, minimalist, and it even resembles Marcel Breuer’s tubular steel chairs. 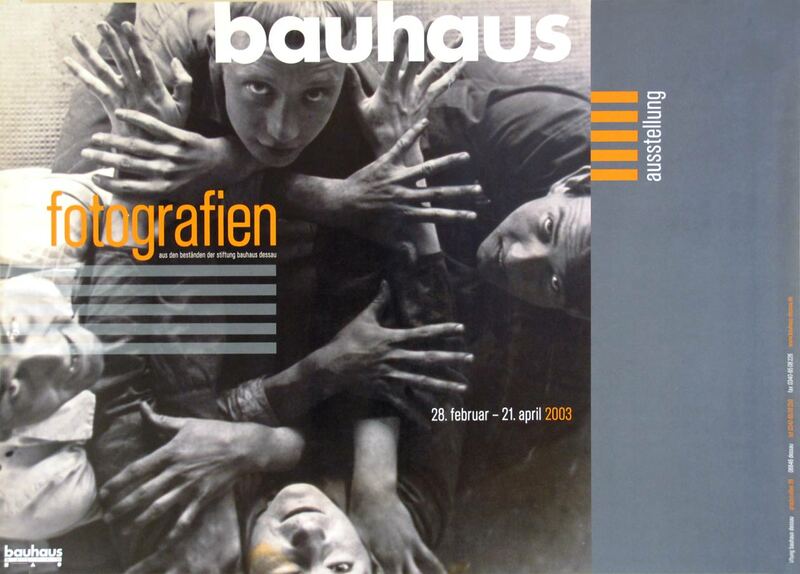 No designer or photographer credits, but the poster was for the Bauhaus Dessau in 2007. Josef Albers – Works on Paper. 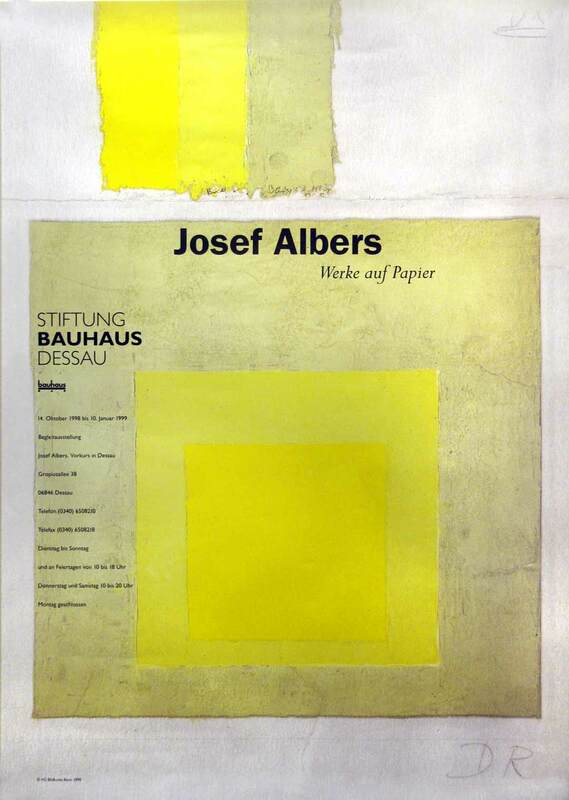 Josef Albers taught the famous Preliminary course at the Bauhaus. His ideas about teaching art were revolutionary, influencing teaching methods up to the present day. He was an analytical colour painter, known for his Homage to the Square series, of which the poster image is an example. This startling 1926 photograph shows the B3 club chair, the Wassili chair by Marcel Breuer, named after Bauhaus professor Wassili Kandinsky. Both Breuer and Kandinsky were Bauhaus teachers. The chair was a product of functionalist thinking about design, inspired by Breuer’s bicycle. 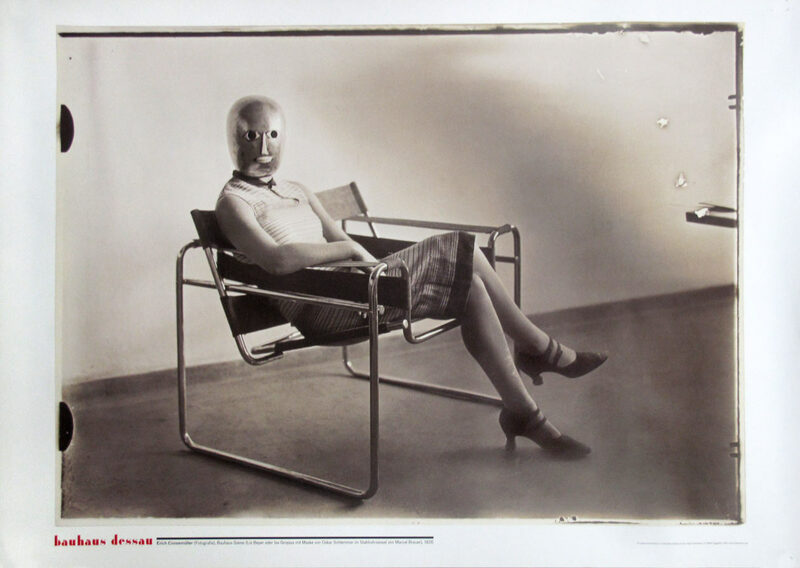 The photograph was shot by Bauhaus student Erich Consemüller and shows a woman, who is either Bauhaus weaving graduate Lis Beyer or Ise Gropius, wife of Director Walter Gropius. She is wearing a skirt designed by Beyer and a theatre mask by Bauhaus teacher Oscar Schlemmer. 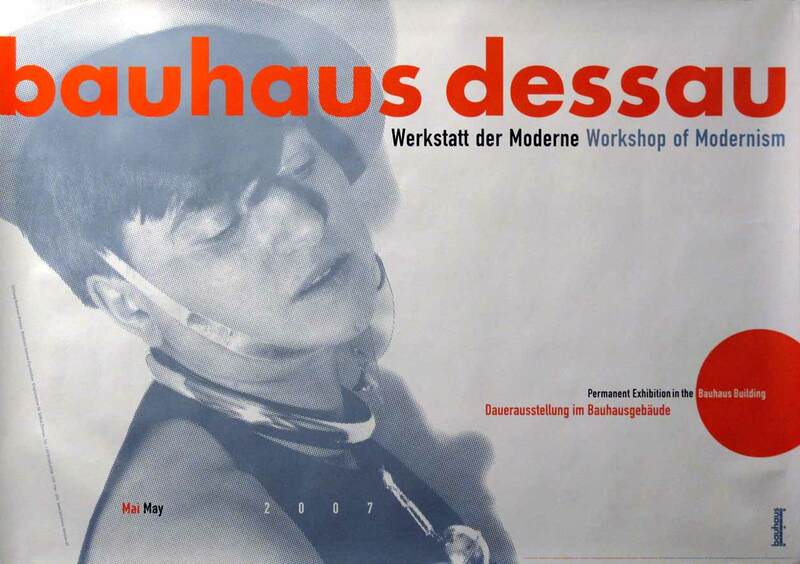 The poster celebrates the Bauhaus Dessau where all this happened. Schrammen was a student at the Weimar Bauhaus in the early 1920s. His wood sculpture “Mascot” was one of the most popular 3D objects to come out of the school. 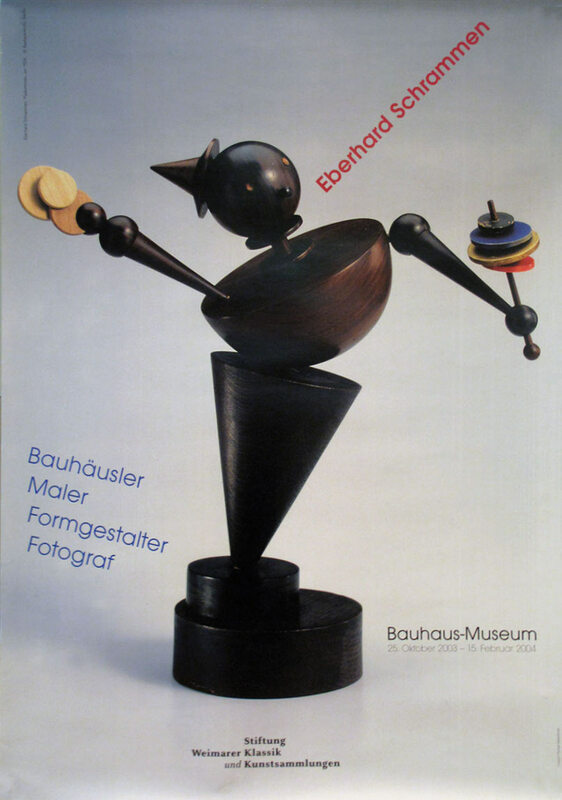 This poster publicizes an exhibition of his work at the Bauhaus-Museum Weimar in 2004. This imaginative design was for the Bauhaus-Museum in Weimar in 2003. It shows a strong use of negative space: most of the poster is empty. 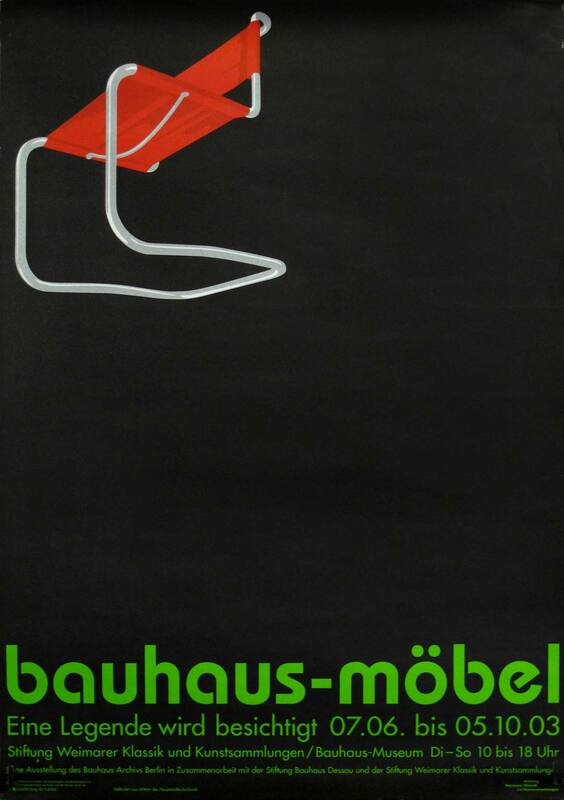 Note the similarity between the tubular steel shape of the chair and the bending shapes of the typeface. It is called ‘bauhaus’ and is related to Herbert Bayer’s Universal typeface, designed at the Bauhaus in 1925 when he was a professor there.